Using concrete joint sealant to seal concrete expansion joints and concrete contraction joints in concrete floors and concrete walls is an important part of maintaining the integrity of the concrete. 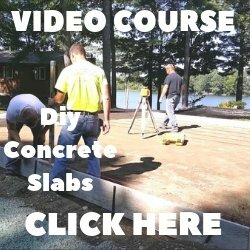 Installing the proper kind of concrete joint sealant will help protect the structure from moisture damage caused by rain, wind, gravity, capillary force, and surface tension. When it comes to concrete floors a concrete joint sealer will protect the joint from damage caused by heavy equipment being driven and/or rolled over the expansion joint, chipping and cracking the edges, which eventually leads to concrete joint failure. To solve many of these problems, manufactures have numerous product options for concrete joint sealing. Three of the most common are liquid sealants, impregnated foam sealants, and hybrid technology sealants. 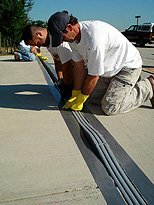 LIQUID SEALANTS - Liquid joint sealants for concrete are mostly used because of the relatively low material cost and ease of installation. High performance silicone sealants provide moisture impermeability, low modulus, UV resistance, and retain these physical properties with changesin age and temperature. Liquid concrete sealants are supplied in tubes, pails, and sausages. They are applied through a nozzle or poured into joint gaps over a pre-placed backer rod. 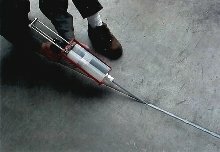 The backer rod serves as a temporary installation aide to keep the concrete sealant from seeping completely to the bottom of the joint. The installer then tools the sealant against the backer rod to achieve the hourglass cross-sectional shape needed for handling expansion and contraction movement. IMPREGNATED FOAM SEALANTS - A second common method of sealing concrete joints is with preformed, impregnated foam sealants. Preformed sealants are supplied ready for installation in their finished, functional state. They are produced by partially filling the cells of high quality cellular polyurethane foam with non-drying, water-repelling adhesive agents. The combination of this impregnation treatment followed by compression of the fully expanded material to as much as one-fifth of its size, creates a concrete sealant material that, when installed in a joint, is always in compression. 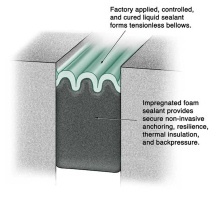 The main advantage of precompressed, preformed, impregnated foam sealants is they provide thermal insulation in addition to moisture impermeability. Impregnated foam sealants, by virtue of their depth, density, and adhesive infused cellular composition, also resist air pressure differentials often found between interiors and exteriors of buildings using forced air heating and cooling systems. HYBRID SEALANTS - Concrete joint hybrid sealants have emerged to create more effective products. Hybrid sealants combine factory-applied and cured silicone bellows with impregnated expanded foam sealant backing. The hybrid sealants overcome the fatigue and potential cohesion failure of concrete liquid sealants. With concrete hybrid joint sealants, the opening and closing movement of a joint gap results in the surface sealant folding and unfolding, rather than stretching an compressing. This eliminates the substrate bond line stresses and failure or composition changes caused by pre-cure joint gap movements. Installation involves removing the concrete hybrid sealant from its packaging that holds it compressed to less than the joint size. The sealant is inserted into the concrete joint opening, recessed to the desired depth, but at least deep enough to accommodate a fillet bead of sealant applied later. A pressure sensitive mounting adhesive on one face holds the material in place while it slowly expands to fill the concrete joint. A fillet bead of liquid concrete silicone sealant locks the bellows to the concrete. The fillet bead is simply used to ensure that the bellows is sealed to the substrate. 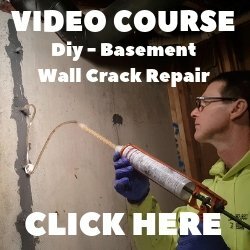 Click on REMOVING CARPET GLUE FROM CONCRETE to learn how to do that.